Having previously tested the beard balm, butter and oil in the Obsidian scent from Savage Alchemy, I then moved onto the Kyanite scent and it is rather nice! Made from natural ingredients the Kyanite beard oil has a base of Hemp seed oil, Jojoba oil, Argan oil & Sweet Almond oil. It has left my beard feeling softer, looking goood and of course it is also beneficial for the skin under the beard as well. Natural carrier oils like these will keep the skin moisturised and so help to prevent dry skin and that dreaded beard itch and by also helping to keep the hair folicles healthy, it will also help to aid healthy beard growth. The scent is a blend of Pink Grapefruit, May Chang, Lemongrass and I love this scent. It is of course citrusy and fresh and the May Chang has helped to create a sherbert like scent. It is actually a burst of scent that lasts in the beard past midday. When people ask me what to look for when buying beard care, I always say handmade, small batch and natural. So we have all of those boxes ticked! 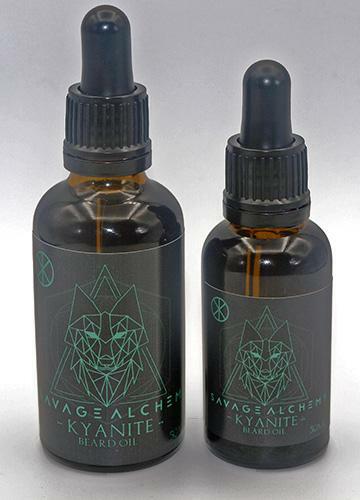 The Savage Alchemy Kyanite beard oil comes in a glass bottle with a glass dropper to dispense the oil and is available in two sizes. The 30ml costs £10.99 and the 50ml costs £15.99 from the website.